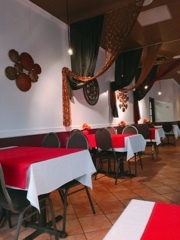 Dining at Ancila’s Indian Cuisine is sort of cryptic, so you'll just have to roll with it. Starting with the reservations: the restaurant accepts them, but I’m told to make sure to cancel, if necessary, as they won't take another reservation for that time. This led me to believe that the dining room is tiny, when in reality it’s a fair-sized establishment. Upon entering, I see one large table is occupied being served by a waiter; not in a rush I wait patiently and it wasn’t until a women (presumably Ancila) leaves the kitchen that I’m addressed and instructed to sit wherever I like. She returns to the kitchen and as I’m sitting there – without water, cutlery, or even a menu – I begin to wonder what’s going on. Finally, when my friend arrives, Ancila comes back to the table and things get clarified. We’re advised there are no printed menus; instead, she'll ask questions to come up with an order: On a scale from one to ten, what is your spice tolerance level? Are you vegetarian? Of the proteins are there any you particularly enjoy? Do you have any dietary restrictions? With that we decided on a creamy medium spicy vegetarian dish and a spicier tomato based meat offering along with rice and naan. Ancila then went back to the kitchen to prepare everything and didn’t return until later to check on our experience. 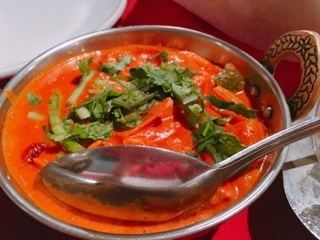 There was plenty of paneer in the tikka masala ($11); soft and fresh, it’s contrasted by a slight crunch from the bell peppers and onion. Being a thicker sauce, this went well sandwiched in between the warm toasted naan. 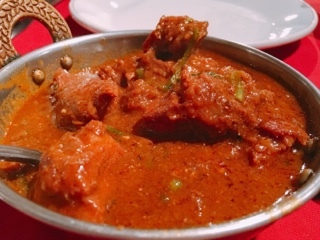 The mutton in the karahi ($12) was cooked well; stewed until tender with the collagen around the bone starting to break down. Cooked to a level-7 spiciness, the tomato, ginger and coriander sauce was hot enough to cause the tongue to sting and bring heat to your face. When too much sauce was spooned onto the rice ($3), a forkful of cooling raita ($2.50) helped calm it back down. A downfall from not having a menu is not realizing all the options available. 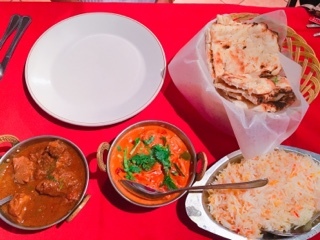 For example, for the sides, aside from rice we also ordered butter ($1.50) and garlic ($2.50) naan (any difference between the two is slight). However, after finding their menu online, I realize they also serve flakey paratha and flavourful briyani, I wish we had those instead. It’s a quaint restaurant and with their no-menu system feels like you’re dining in Ancila’s home. “Let me make you a bit of food, what would you like?” it sort of feels like. The dishes take a while to prepare but what comes out is piping hot and made-to-order. Just be mindful about adding items too late in the meal, depending on the time, they may not be able to make dishes as even the samosa dough is made fresh. Like dining in a home, it’s a calm unhurried experience – there for a later dinner, Ancilia assured us to take our time and chat more, despite the restaurant being closed. What started off a little puzzling ended up being a good experience.